Cambridge (MA) & London: The MIT Press. This is a remarkable book and a fabulous resource for radical walkers and walking artists. Interpreting ‘mapping’ in the broadest sense, O’Rourke has assembled a tremendous array of tactics and artworks that deploy walking in some way or another; as research, as performance, as fluid sculpture, as algorithmic walk-on. 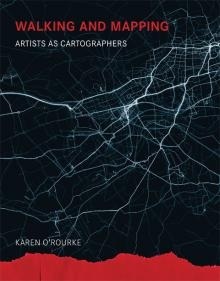 O’Rourke has a firm grasp of the burgeoning field of ambulatory practices and the usual suspects are present and suitably incorrect as well as many artists and walkers I was meeting in these pages for the first time. Don’t be put off by a couple of early magisterial generalisations (“walking is...”, “mapping is....”), this is a sensitive and well-judged account of a range of variegated practices, always contextualised and with sufficient detail to inspire emulations and variations. This really needs to be on (and repeatedly off) the bookshelf of anyone who is seriously engaging with walking in their explorations, politics, arts, performances or disrupted everydays. Crucial to this book is that so much of it is about walking artworks and actions and performances that O’Rourke made, saw or participated in. That is why the book is such a fine practical resource; although it presents itself as a review of a multitude of practices, it is also a user’s guide made by a user. There are radical walkings, disruptions, interventions, provocations; “walking [that] means aligning oneself to some extent with a rebellious reclaiming of common rights” (Donna Landry), a struggle for public space and common access to it. But there are also walks that sound more like exploitations and dead ends: playing human chess, for example. O’Rourke is not scared to point out where artists claim a revolutionary quality though “none of these works really diverts or hijacks anything”. Some of the supposedly political works here are far better thought of as aesthetic works. O’Rourke presents a number of web-based projects. The review is revealing; these projects render up far too little in the way of complex engagement given the massive informational sources they have at their disposal. Yet the projects that explore surveillance, Michelle Terran’s Life: A User’s Manual stands out, are particularly powerful and resonant. Walking and Mapping celebrates walking, but it also challenges walking - with things, prostheses, blank placards and audio walks tripped up by maintenance works. It is full of lovely vignettes - how Janet Cardiff came to make audio-walks or how the protocols of the Autonauts of the Cosmoroute worked out in practice – but it never gets caught up in any one journey for too long, soon sending the reader spinning off into new ambulatory possibilities. A must have.